Circuit Gilles Villenueve sparkled in the dense sunshine, the weather every bit the gloriousness one expects Montreal to deliver this time of year. 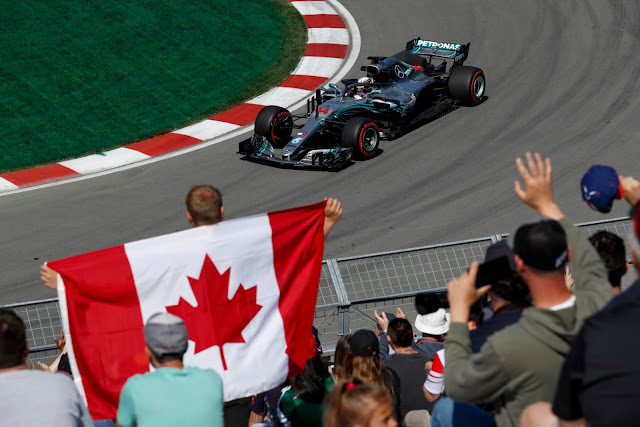 Mercedes on the Ultrasofts looked positively terrifying but having brought just enough Hypersofts for qualifying, it's clear that their focus is more on race pace as Canada has a relatively low win percentage from pole compared to, I don't know, let's say Monaco for example. So they most certainly will try to make Q3 on the Ultra's as opposed to the Hypers, with the only question being will Ferrari and Red Bull choose to follow suit. Still, the lack of running on Hypers looks to have penalised them relative to both Ferrari and Red Bull, and crucially there was rather a lot of work being done to the front end of Hamilton's car just before he set his fastest times. HE was dead quickest in S1, just missed in S2 and was well off in S3, but he had also done an aborted lap that saw him bail at the end of S1 so he might have just enough in hand to pull it off. Should be interesting. An oil spill at T7 will also complicate Q1, as it had been cleared but the drivers were advised with 10 minutes to go that the track would be "dusty". Another unfortunate event is the lack of running Ricciardo had, after he melted his MGU-K in Monaco. The unit was repaired, however, it seems that his pace with the repaired engine was not evident in any of the practices, though one could think it likely that they will stress his PU as little as possible. In any event, he was unusually off the pace, as was Bottas for Mercedes, who improved the least amongst all the sharp end when he strapped on the softest of the tyres. Green Light!! Goodness, RoGro's engine let go in magnificent fashion with just 20 seconds gone from the 18 minutes of the first session. Meanwhile, Leclerc, Magnussen, Sirotkin Ericsson all carried on on their outlaps. Vettel and Raikkonen were out and early days it was Sirotkin on top till Vettel dethroned him with a stout 1:12.11. 3 minutes to go and Ferrari decided that WAS a good idea and followed Mercedes out as Leclerc took advantage of a fairly empty track to improve to P13. Alonso was the head of the queue rolling down the back straight as the clock ticked down toward a minute. Personal bests for Alonso in the first 2 sectors as the drivers backing up for their laps interfered rather seriously with Vettel's attempt at a lap. Perez and Ocon were halfway through their laps, setting personal bests and then Raikkonen kicked it off and immediately went wide at T2 chucking it out the window before he even got started as the sharp end got under way. For a moment, it looked like the Force India drivers might even catch up the sharp end finishing their outlap, but that's what you get for taking the app GPS too seriously. Ocon outpointed his teammate with a mighty S3, taking enough advantage of the brute force of his Mercedes' PU to be able to split the Renault's as well, who decidely had the advantage in S2. Hulkenberg was just that bit quicker than Sainz in the last sector, though, and managed to maintain his place as best of the rest, whilst Sainz slipped behind the fast Frenchman of Force India. Perez had a dismal final sector, and wound up nearly 0.5 seconds off the back of Sainz. Hamilton was all over it after Kimi mucked it up, ahead of Vettel early on, but a lockup into T10 cost him and it was P3 and a consistent inability to get round S3 as Vettel brought it home with a 1:10.764. Verstappen meanwhile turned S1 purple and was stealing focus like mad by not crashing things, while Bottas, rocked it across the line in P2, mistake free and in a most unassuming way. Verstappen kept on it, thrashing the car through the lap, but the long back straight did him no favours. Despite this, he was STILL able to slot it into P3, ahead of Hamilton, complicating James Vowell's night considerably. Tomorrow's race is now full of all kinds of interesting, Verstappen P3 combined with the fantastically crashtastic T1-T2 complex should yield all sorts of excitement. With passing a real possibility there should be plenty of action throughout the field, especially from RoGro and Gasly near the back with reasonable pace to deploy. Mercedes have been weak in traffic, and should Lewis get stuck behind Verstappen it will go very bad for him quickly. Still, with DRS and despite a non-updated PU, the Bulls look vulnerable down the long straights. Less so will be his teammate and the curiousity of how Mercedes will handle that is to be much anticipated (plan B, Valterri? ), should Bottas prove unable to get round Vettel. Of course, said crashtastic start could easily upset the apple cart but at the moment, Vettel and Ferrari look once again like they have the package to beat and the real mysteries, and heart of the competition lay in the midfield this round.